Crude roil prices rose sharply during yesterday's session and continue to rise this morning printing new highs not seen since 2014. 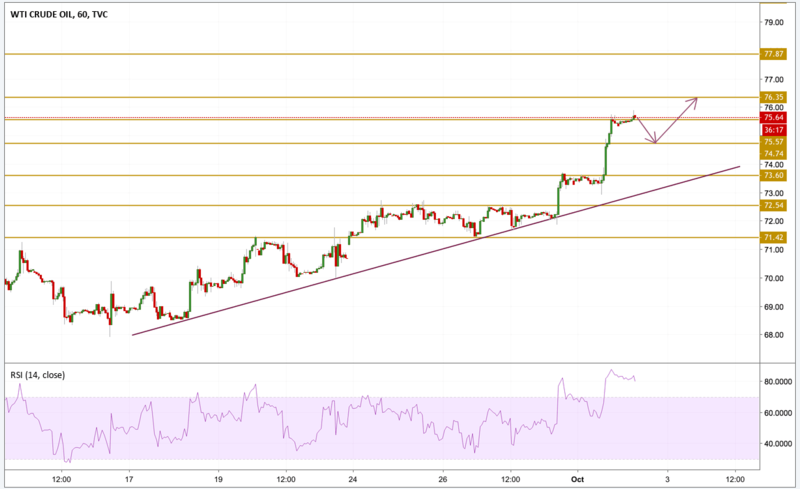 The combination of stronger expected demand and a perceived tightening supply has led the bulls to succeed in getting the prices closer to the $80 round figure. Today's API Crude inventories will also affect the short-term direction of oil as any decrease in the numbers will lead prices higher. Prices finally broke above the $75.24 level which was last seen in July. Extreme overbought conditions don't seem to have any effect on the price but eventually a divergence will occur and a small consolidation or correction will happen but we still remain bullish. The next level to watch is the 76.35 resistance level.